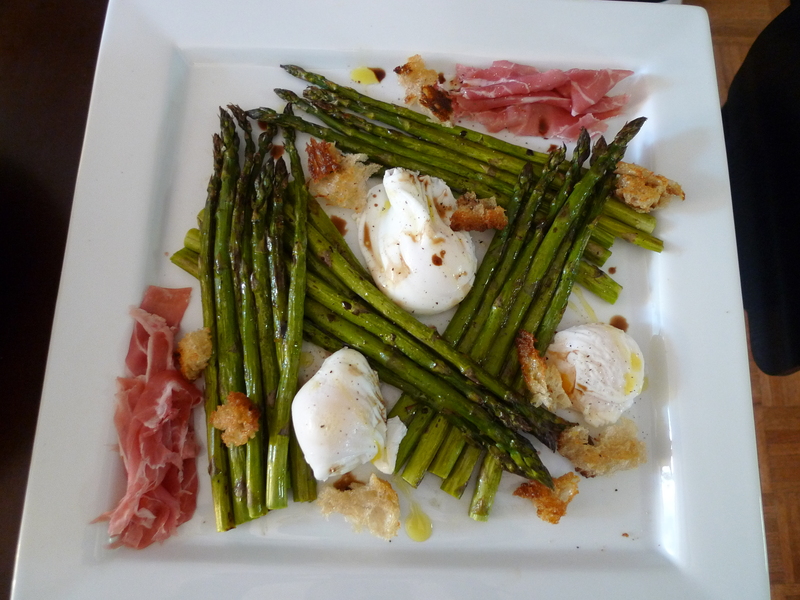 Here is a very classic savory salad with sweet and tender asparagus, poached eggs, and prosciutto from my Ad Hoc at Home cookbook. The aged balsamic vinegar balances out the richness of the egg and salty ham, and the fried croutons add a nice crunchy texture. Poached eggs are my favorite kind of eggs (obsessed with Eggs Benedict! ), although still working on my poaching skills… err actually only Natalya knows how to do it really… I have yet to try hah. 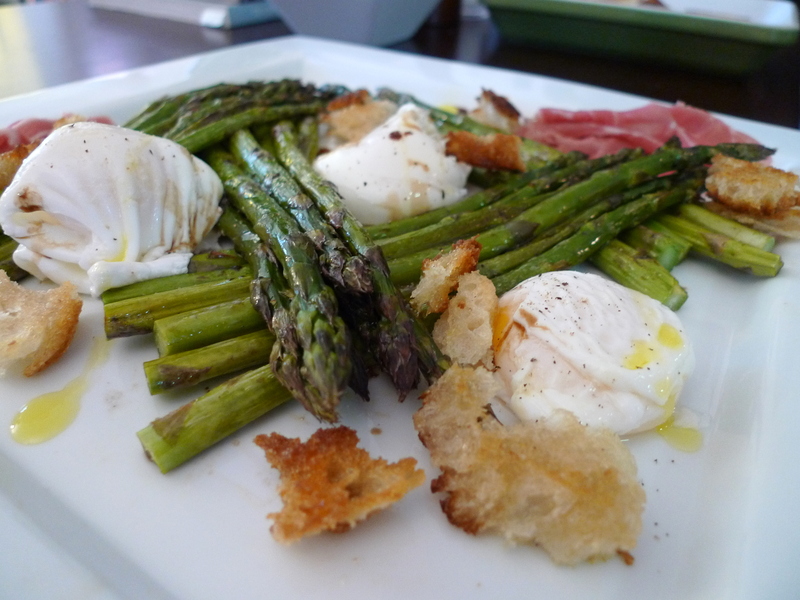 Natalya likes making Poached Eggs with Smoked Salmon and Tomato but for Sunday Brunch recently, we decided to switch it up with prosciutto and asparagus. The recipe calls for grilled asparagus but as I don’t have a grill, I ended up roasting it instead. Along the same lines, another savory salad with poached egg recipe I want to try is Roasted Artichoke Parmesan with poached egg, pancetta, hollandaise which I had tried at Extra Virgin. Shall attempt that soon! To poach the eggs, bring 2 to 4 inches of water to a boil in a large deep saucepan. Prepare an ice bath. Add the vinegar to the boiling water and reduce the heat to a summer. Crack 1 egg into a small cup. Using a wooden spoon, stir the water at the edges of the pan twice in a circular motion to get the water moving, then holding the bowl just above the surface of the water, gently slip the egg into the simmering water. Poach the egg until the whites are set but the yolks are still runny, 2 1/2 to 3 minutes. Prepare the asparagus with to be grilled or roasted. Hold an asparagus spear and bend it to break off the less tender bottom end. Trim all of the asparagus to the same length. If using medium or large asparagus, peel the stalks with a vegetable peeler. 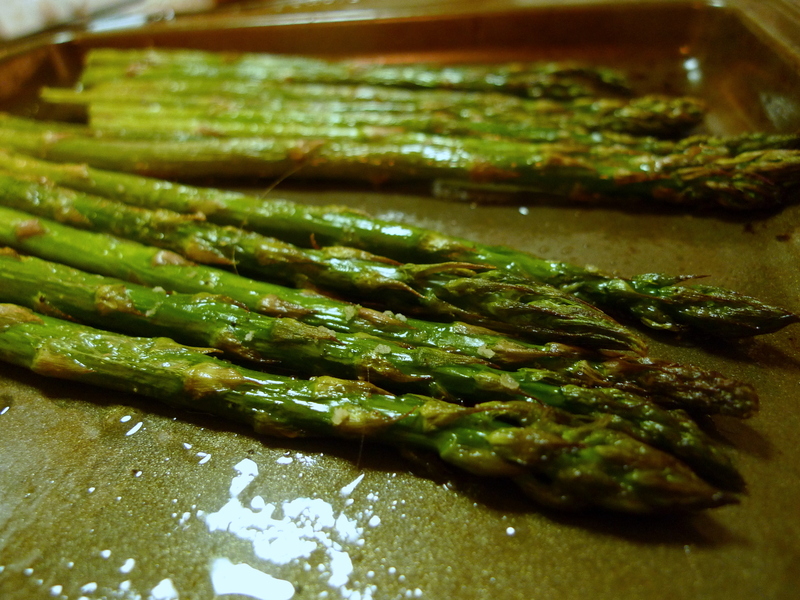 Spread the asparagus out on a parchment-lined pan, generously coat with canola oil, and and season with salt and pepper. Roast in the oven at 425°F for 10-15 minutes, or cook on a grill for 1 1/2 to 2 minutes per side over medium heat. Meanwhile, bring a large pot of water to a simmer. With a pair of scissors, trim any uneven edges from the poached eggs. Lower the eggs into the simmering water for about 30 seconds, just to reheat. Remove the eggs with a slotted spoon and blot the bottoms with paper towels. Season with salt and pepper and arrange on a platter. Arrange the prosciutto and croutons on the platter. Drizzle the salad with olive oil and balsamic, and sprinkle with fleur de sel and pepper.